Another Day In Pensacola: I won! Just in time for my birthday too! 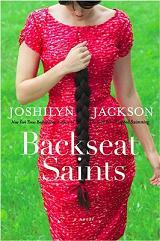 Just wanted to share that I won the book "Backseat Saints" by Joshilyn Jackson from Katie at Katie's Korner! Please check out Katie's blog. She has great ideas, and I think her blog roll might be even longer than mine! If you like good Southern fiction (that is to say, Southern women's lit.) you'll love Joshilyn Jackson's books. "Between, Georgia" is my personal favorite so far, but this one is supposed to be a follow up to "Gods in Alabama" and maybe it will become my new favorite? Thanks, Katie! So looking forward to curling up with this one. Hey, Wendy, I've been meaning to check with you...did the book arrive? I still haven't started reading my copy yet!